Their names sound like ukulele. I just now got that. Remember Banjo-Kazooie? Of course you do. The game helped popularize the 3D platform adventure back in the golden age of the PS1 and Nintendo 64. We haven't heard much from the bear-bird combo since the last game hit back in 2008, but a group of former Rare employees wants to keep the spirit alive with a brand new "inspired by" release titled Yooka-Laylee. The Playtonic Games team is made up of developers who worked on both Banjo-Kazooie and the Donkey Kong Country games. 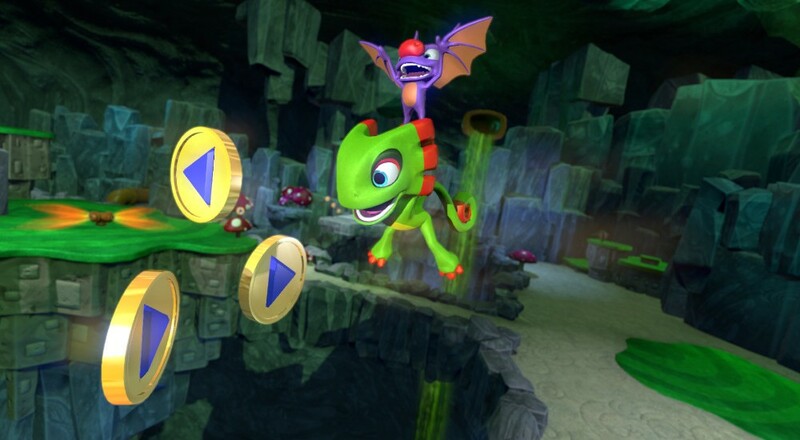 The goal with Yooka-Laylee is to bring back the best of those games in a brand new setting, complete with tons of areas to explore, items to collect, abilities to unleash, and fun scenes to encounter. Players can even expand the world by spending collectibles, which sounds like a great excuse to go for 100%. Yooka-Laylee pulled off a successful crowdfunding campaign 38 minutes after going live, and over the next few days it's blown past every stretch goal the team set. The expected release is October 2016, and the target platforms are Windows, Mac, Linux, Xbox One, PlayStation 4 and Wii U. The PC version has been confirmed to contain local co-op multiplayer. There's a long road before the game's details are finalized, so consoles could get the same feature before it goes gold. And just so you know moving forward, Yooka is the green guy with no pants, and Laylee is the bat with Rudolph's nose. Page created in 1.9195 seconds.